There is a common misperception among those who are concerned about the practically of producing societal value calculations that there are insufficient metrics available to do this work. In fact, numerical and monetary data that can be used for this purpose is widely and freely available. Sustainable valuations rely upon gathering information from people who are affected by the intervention. Where possible these people should be questioned to understand how their lives have changed or might change before a project has started. Existing consultation arrangements to establish societal value are inadequate because they do not make time or provision to understand the underlying factors that influence the lives of the local community. Without this, commissioners, developers and designers can have no reliable way of knowing how their scheme will affect the lives of those that experience their developments. The development and application of societal value tools help all those involved in the development process to understand the full reach of the value created by development. These could, at the very least, better inform negotiations about the merit of proposals and alternatives. These tools should be linked to existing processes rather than create new ways of working that would need to be retrofitted to existing practices. A common question that arises from the calculation of societal value is; where does the money that is generated in development that improves people’s lives go? Some undoubtedly flows to developer in the form of higher rents, reduced management fees, void turn-around expenditure. However, much of the societal value that is produced as a result of improvements to people’s lives is distributed elsewhere in the economic system. This is a valid concern as it affects the long-term viability of the scheme. 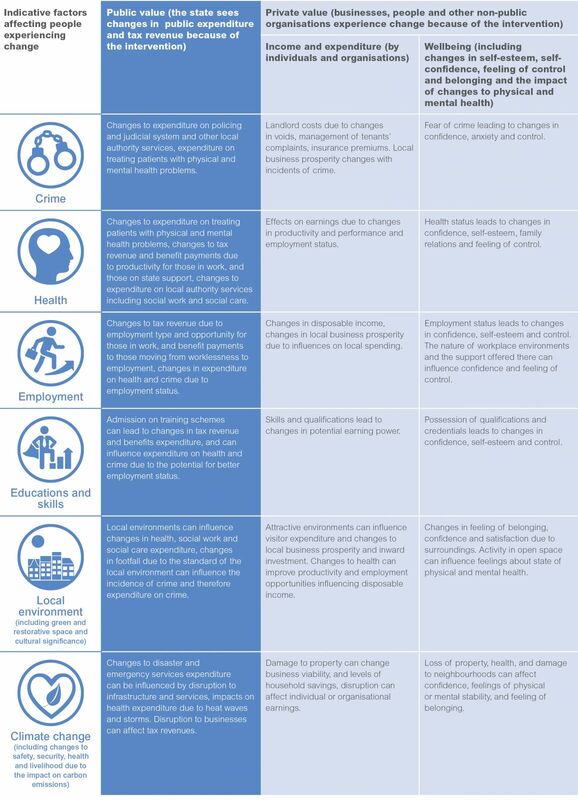 This section of the report includes a number of tools and approaches to advance the thinking and practices of those open to improving the way that societal value is understood, maximised and measured in the real estate sector. The principles preserve the goal of monetising change to human lives by ensuring they are involved in creating the data set in a way that everyone can understand, and then making sure that only the most important information is used to calculate the return on investment. Monetising social and environmental change allows the added value of a scheme to be considered alongside conventionally assessed financial returns. Not only is this a more comparable method to employ, but it also makes it easier for non-technical stakeholders to understand the implications of the options and trade-offs that might be considered in the design stage. RealWorth uses an approach it has developed called Sustainable Return on Investment or SuROI to evaluate the social and environmental changes caused by projects, programmes and investments. Other practitioners (Social Value Portal, Social Profit Calculator, nef for example) offer alternative approaches. The aim of SuROI is to allow the environmental and social value of a project to be made explicit through evidence, and then monetised to show the value relative to the amount of investment. The approach classifies both environmental value and social value as an economic benefit. For example, value arising from employment outcomes is classified as a social value and monetised to create an economic benefit in the same way that savings in CO2 are monetised to create an economic benefit (albeit using different indicators and proxies). SuROI gives an overall sustainable value in financial terms and a return on investment ratio which can be used by decision-makers in a variety of ways. The SuROI approach assesses the degree to which change has occurred (whether positive or negative) both in terms of the significance of the change, and the numbers of people that experience the change. A sustainable value study relies upon the information from people who are affected by the intervention, and/or those who have an insight into the effect of the intervention. Where possible these people are questioned to understand how their lives have changed or might change (before a project has started). Stakeholders (groups of people, organisations or entities that experience change, whether positive or negative, because of the activity/intervention that is being analysed). A typical stakeholder group might include residents, employees, visitors, beneficiaries of charities or other third sector organisations, and people living close to the intervention. Inputs (the cost of the project including capital investment, the monetised value of volunteers, and any other in-kind contributions). Outputs (the number of units of delivery where applicable). Outcomes (the stated or predicted changes to stakeholder’s lives). Each of the outcomes are categorised against factors. These are topics that affect stakeholder’s lives including crime, health, wellbeing, training and skills, employment and green and restorative space. The outcomes are then monetised by first identifying an appropriate indicator (the unit of measurement), and then applying a suitable monetary value (or proxy) to each indicator. The values are multiplied by the numbers affected (from the survey returns / field data) and the amount of time the influence of the project / intervention was likely to stay with them. The duration of the project is taken as the time in which it occurred – in this case one year. Indicators and proxies are typically taken from a wide range of sources including local and national government statistics, research bodies and think-tanks, and representative or accreditation organisations. Ecological value is derived from databases compiled through work on the Millennium Ecosystem Assessment. All the sources that RealWorth use are publicly available. The monetary implications of these changes are then combined to establish as the gross sustainable return on investment. The net value is derived after adjustments are made for other influences that might have contributed to the outcomes, and the effect of time in terms of lessening affects or depreciation. The results are presented as an overall sustainable value at project level, and on a project-by-project basis. The results are also segmented against stakeholder group and factor. The breakdown of the results assists decision-makers to understand variances in return on investment, and (where appropriate) to focus on the way one stakeholder group or factor (societal issue e.g. crime, health etc.) might benefit from a project. 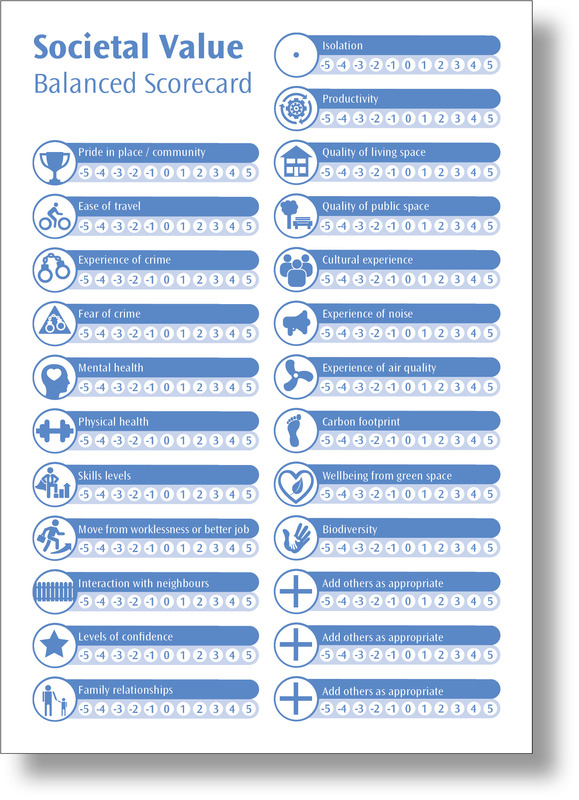 Tools such as balanced scorecards have been created for a number of purposes to help planners and designers to be systematic and comprehensive in their consideration of the impact that development can have on people. Figure 1 shows and example how a balanced scorecard might be constructed that seeks to capture social and environmental value as reported by the stakeholders who are impacted by a proposal or an established development. Some of those interviewed for this report thought that a form of rationale or toolkit for the public sector might contribute to a more transparent process of decision-making about what elements go into a development scheme. The feeling was that if this was in place, as a matter of statutory requirement, then short-term political expediency would be less likely to influence decisions. The value that development creates is cause by the changes it makes to people’s lives. These changes not only affect those who live, work and visit the building and grounds of the scheme, but can also profoundly influence those that occupy the space around the development. The construction of tools that help investors, designers, planners and elected officials to understand the full reach of the value created by development could, at the very least, better inform negotiations about the merit of each proposal. At best this approach could accelerate negotiations about the inclusion of features, and the terms of any legal agreements. Much of the societal value that is produced as a result of improvements to people’s lives is distributed elsewhere in the economic system. Figure 2 contains an illustration of what a societal value distribution tool might look like, and some of the factors that could be considered in a discussion about impacts and trade-offs from development projects.